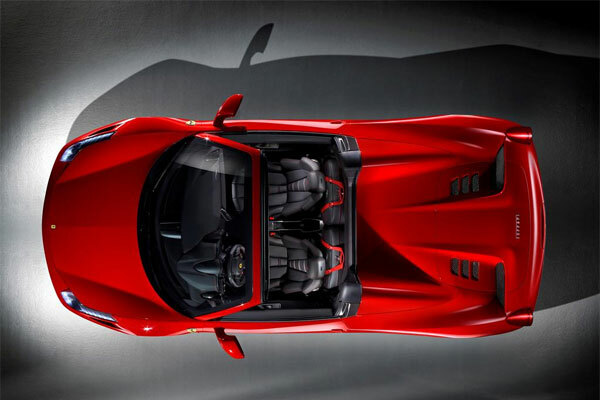 Ferrari is the name of excellence; its vehicles are renowned among the enthusiastic drivers who want to experience unique driving fun with comfort, convenience and style. Ferrari vehicles add sense of style and uniqueness to the driving potential of drivers and offer them a reason to feel different. Launch of Ferrari vehicles enhance the quest of people with sportsman spirit and make them fall in love its new models. Ferrari 458 Spyder made a debut in Frankfurt Motor Show and surprised the world with its unique styling features and stunning looks. 458 Spyder features Ferrari patented entirely retractable hard top which will be the first one for the sports car in this lay-out. Powertrain of Ferrari 458 Spyder: Ferrari 458 Spyder is powered by 4.5L V8 engine which is naturally aspirated with direct-injection. Its engine was designated as “2011 International Engine of the Year” due to engineering distinction in reference to drive-ability, fuel economy, fine-tuning and performance. Outstanding performance of 8-cylinder Ferrari is enhanced by the world-class double clutch F1 paddle-shift transmission via stylish E-Diff incorporated with F1-Trac traction control. A part from this highly performance oriented ABS contributes in performance to provide utmost handling dynamics. Sporty features of 8-cylinder Ferrari 458 like acceleration pedal mapping and multi link suspension (damping) are standardized to offer pleasure in driving experience. 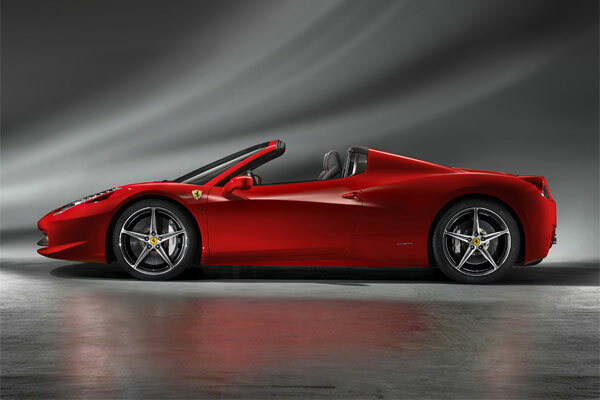 Hard-Top Solution: Hard-top solution acquired by the Ferrari 458 Spyder is totally in aluminum and it provides several benefits to it as compare to the conventional folding (top-down). The advantages it offers include decrease in weight by 25Kg; Hard-top is entirely incorporated into the styling of Ferrari 458 Spyder and it has been especially designed to finely fixed at the forefront of the engine bay without affecting the performance and aerodynamics. Design of Ferrari 458 Spyder: Back of the Ferrari 458 Spyder features innovative and dynamic styling and its buttresses shape optimize the air flow to engine, clutch and gearbox oil radiators. 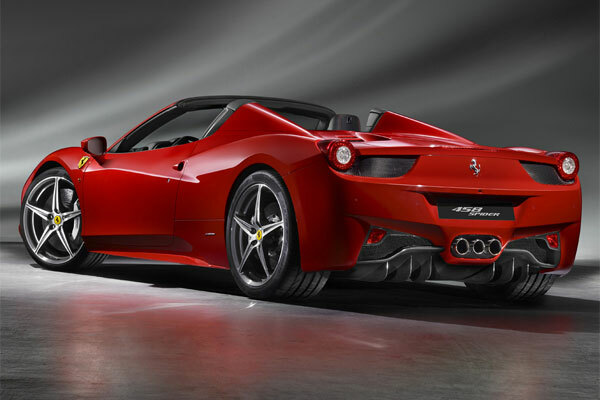 An electric wind stop in Ferrari 458 Spyder provides utmost comfort while moving it top to down. Its design is absolute to strew and slow the air in cockpit hence normal talk is possible in it even with speed of 200Km/Hr. 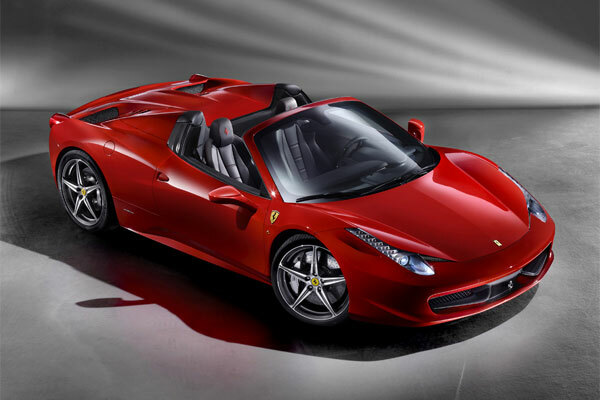 Dimensions of Ferrari 458 Spyder: Length of Ferrari 458 Spyder is 4527mm, its width is 1937mm and height is 1211mm. Wheel base of this super stylish sports car is 2650 mm which contributes in enhancing its road grip. Dry weight of 458 Spyder is 1430Kg with weight to power ratio of 7.42lbs/kW. Performance of Ferrari 458 Spyder: One can achieve maximum speed of 198 mph with Ferrari 458 Spyder and it can be accelerated from 0-100Km/Hr in just 3.4 seconds. This stunning sports car is fuel economical and consumes 11.8 liters of fuel per 100Km; it is also eco-friendly as well and its emission level is 275 g CO2/Km. Hence you don’t need to worry about the environment and fuel consumption, it will be light on you wallet and on environment. Exterior of Ferrari 458 Spyder: Ferrari 458 Spyder is simply stylish and complete blend of performance oriented features and stunning looks. Like the other sports model, this new one will also attract you due to its eye-catchy looks of exterior. In other words you can say that it is the sports model that will drive you crazy after the first drive. Ferrari 458 Spyder is a wonderful sports car with superb features which makes it heart throb of millions of people who always seek fast and furious sports car will all desirable performance oriented features.